Right now "Dexter's Laboratory" and "Samurai Jack" creator Genndy Tartakovsky is busy working on an animated feature film adaptation of the classic sailor cartoon Popeye at Sony Pictures Animation. But Tartakovsky will be very busy at Sony with two more projects in development at the studio. 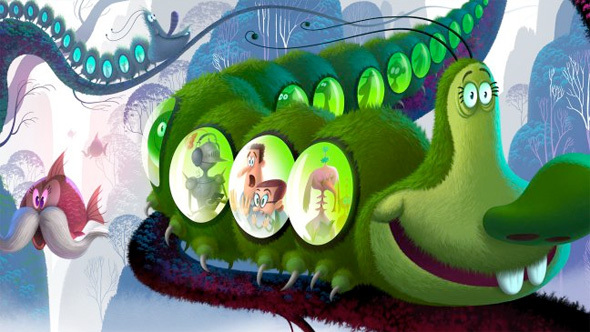 Tartakovsky has just signed on to direct a Hotel Transylvania sequel after directing the original film starring Adam Sandler as Dracula, but he's also working on his own original creation that is currently titled Genndy Tartakovsky's Can You Imagine?, and it might be a little similar to something Pixar has coming soon. The more detailed plot is being kept under wraps, but THR says the film is briefly described as a fantastic journey through one boy’s imagination. That explains the concept art above, but we're wondering how many similarities there are between this film and Pixar's Inside Out, which is also supposed to dive into the mysteries of the human mind. We're sure each film is unique in their own way, and Tartakovsky is one of the best talents working in animation today. Finally, in the realm of Sony Pictures Animation, the popular adaptation of The Smurfs is getting mixed up a bit. While the previous two films in the franchise were a mix of computer animation and live-action, this new film will be fully animated, looking to bring the original artwork by Peyo to life. It's not clear if any of the voice cast, which includes Katy Perry, Fred Armisen and more, from the first two films will reprise their roles, but the animated take on The Smurfs 3 will be an origin story and is set for release on August 14th, 2015. Can Sony compete with DreamWorks Animation and Pixar? We'll see.